And, it was so hot this weekend. So very hot. We tried to keep our house cool and at least a few times, had regrets about choosing a tankless hot water heater over a heat pump with air conditioning when we added new appliances earlier this year. We have a portable window A/C unit that does take the edge off of the heat in our house, but just barely. To beat the heat, we booked a mini staycation at the Hampton Inn in Bellingham, which is off of Bakerview, near the airport. We had won an overnight stay at the Boys and Girls Club auction earlier this year with this in mind — a quick overnight stay to play in the pool when the summer weather was just too much to bear. We certainly didn’t think that we’d be using it so early in the summer — Josh and I both predicted it would be August before we’d give in — but we enjoyed every second, regardless. We checked in around 3 p.m. and went straight to the pool. It is an outdoor pool and we spent the rest of the afternoon splashing and keeping cool. And, boy, did it do the trick! Eventually, we came back to our room (which was awesome, clean and plush, by the way), ordered pizza and Rio 2 and chilled out for the night. Before long, these two were out for the count. Janie and Josh headed back to the pool for another swim and I worked, in silence, with the air conditioner blasting. This morning, we did have to pop over to swim lessons bright and early (7:45 a.m. for the next two weeks… brilliant or not? TBD) and now we’re back at the hotel, munching on breakfast (hello, breakfast bar! ), taking baths, playing and working. I think that we’ll add this to our adventure list for every summer. It was nice to getaway without actually having to getaway. We felt like we were on vacation, even though we were about 10-minutes from home and the good night’s sleep in the cool room did us all some good. Plus, I was so pleasantly surprised by the Hampton Inn. We often stay at them when we travel and this one was great for this staycation adventure. The staff was so sweet to the kids (they even printed out Frozen coloring sheets for them this morning! ), the pool is big and awesome, and there’s free coffee. I’m not sure if I need much more than that, honestly. Have you ever done a mini-staycation at a local hotel? 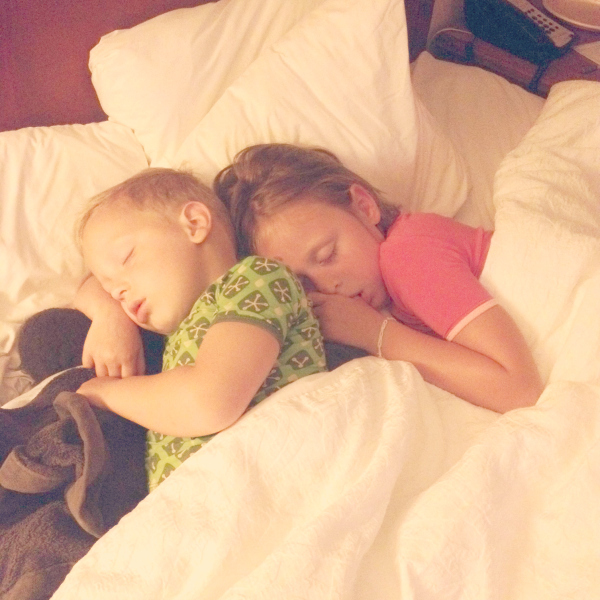 This entry was posted in Life and tagged 2014, Hampton Inn, Staycation, Summer on July 14, 2014 by Katie Kavulla.